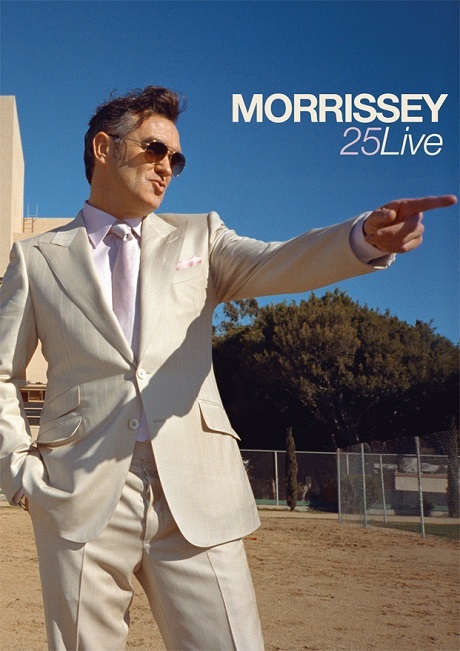 Watching a Blu-Ray of any show — even his intimate March 2, 2013 show at Los Angeles' Hollywood High School — probably won't change anyone's opinion on an artist, but for the uninitiated, 25: Live gives a pretty good idea of what to expect at a Morrissey show these days. After some establishing shots of line-ups and crowds at his Staples Centre show the night before and some talking heads gushing about seeing Moz in a small high school auditorium, the concert begins with "Alma Matters." He waxes whip-like with his mic cord, spinning it like a sideways lasso between occasional reaches into the crowd. The show is defined by passion; from Morrissey, sure — "I hope in the future... Wherever I may be... Please remember: I love you," goes his banter at one point — but especially from his fans. When he hands one the mic early in the show, after a rousing "November Spawned a Monster," the fan thanks Morrissey for "teaching us about ourselves." It has the tenor of a prayer, and there are offerings to boot: during an emphatic "Still Ill," fans hand him homemade gifts along with the now-trademark roses that stretch from fans' eager arms towards him. Live, Moz's beefy band adds emphasis to the guitar swells and solos, as on "That Joke Isn't Funny Anymore," during which Moz leaves to change from a shirt of thick blue flowers to one of more delicate, multi-colored arrangement, and throughout the formerly mandolin-played solo of "Please, Please, Please Let Me Get What I Want." The crowd sings along enthusiastically to all of Morrissey's songs, but they're especially audible on "Please," while "Every Day is Like Sunday" is composed mostly of crowd shots to show the looks of longing on the faces of his diehards. There are a few funny edits in the film — the "demented" shots of Moz at the beginning of "Let Me Kiss You" and a "water ripple" transition earlier on are cheesy — but for the most part, it's a straightforward look at the performance and drama that define Morrissey and the relationship he shares with his fans. It's both novel and poignant when, during "Kiss," he performs his now-trademark shirt-rip and throws it into the crowd. Whether you're a Morrissey fan or not, there's something touching about watching the converted frantically throw themselves onstage during "The Boy With the Thorn in His Side" to kiss his hands as security struggles to hold them back. Near the film's end, security allows a young boy onstage; Morrissey hoists him up and holds his hand before ending the song and ripping off another shirt to offer to his devoted. "He offered us salvation when we were truly alone," enthuses a typically snide Russell Brand in an additional feature about his opening slot on the show, as he points out that Morrissey would happily die onstage. Having watched 25: Live, it's pretty hard to disagree.